Tiggs was originally homed in March of this year but had to come back to us. 12-18 months old, Tiggs has now found home with someone else as of 31st May 2012. Thank you to his new owner. 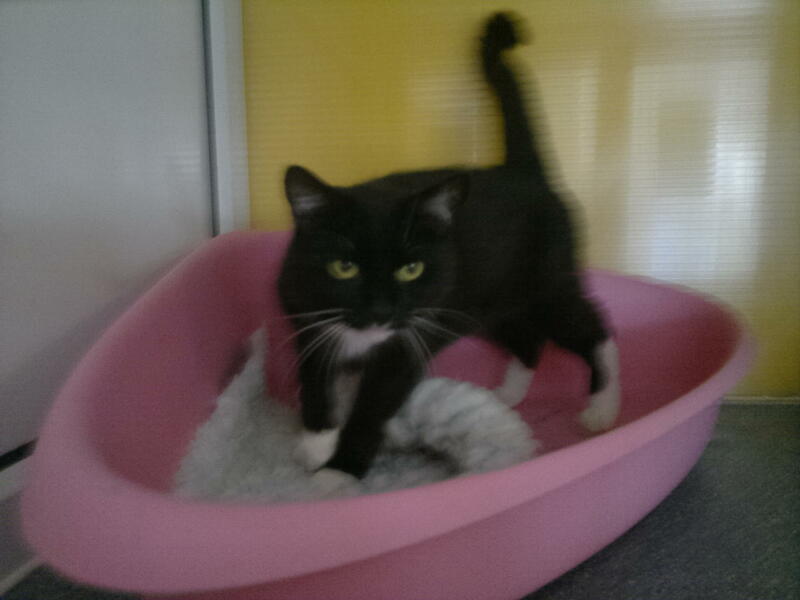 Princess is now reserved to be collected Sunday 3rd June….Great news and we wish Princess all the very best in life. Wally now has a home! Now a resident as nobody has adopted him….he has become a really friendly boy. He could still be homed. He is loving the outdoors and would suit a family that has garden space….He can hold his own that’s for sure so don’t worry about homing with another cat. This is Popcorn. He was left outside the Cattery recently .He is I.D chipped but so far these details have proved very unhelpful. 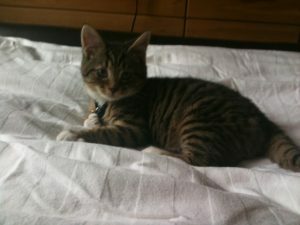 As a result of this, we cannot yet put him up for adoption but he will be available (if not claimed) on the 29th April 2012. 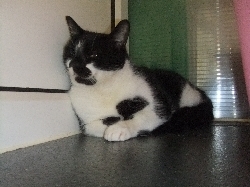 He is very friendly and sweet natured and very handsome as well! He would make an ideal ‘friend’ and companion. If you might be interested in him as a extra member of your household, then please contact the Cattery on 0161 6536530 or call in and visit. Thanks Sue . Success Stories, We have been homed! Scotia needed to be homed somewhere with NO OTHER CATS, was around 9 years old and only had 3 teeth but EXTREMELY LOVING. She needed a long-term home and is also on occasional medication as sometimes her stools are loose but the medication helps with this. She loves a good chat and loves to rub around your legs at feed time and enjoys the warmth and comfort of the human knee. We had Scotia for many months as nobody was interested in the beautiful Lilac point Siamese. She is so adorable, most of our volunteers would take her in a heartbeat but we all have cats. 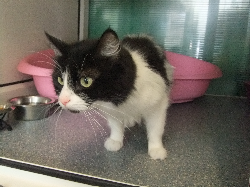 Due to her medical issues the vet advises that she can’t be rehomed with other cats sadly. We really seriously struggled to rehome her and began to give up hope of that special adopter ever coming along. But on the 23rd June 2012 the perfect person chose her and our dear Scotia has been rehomed………A long wait, but well worth it. 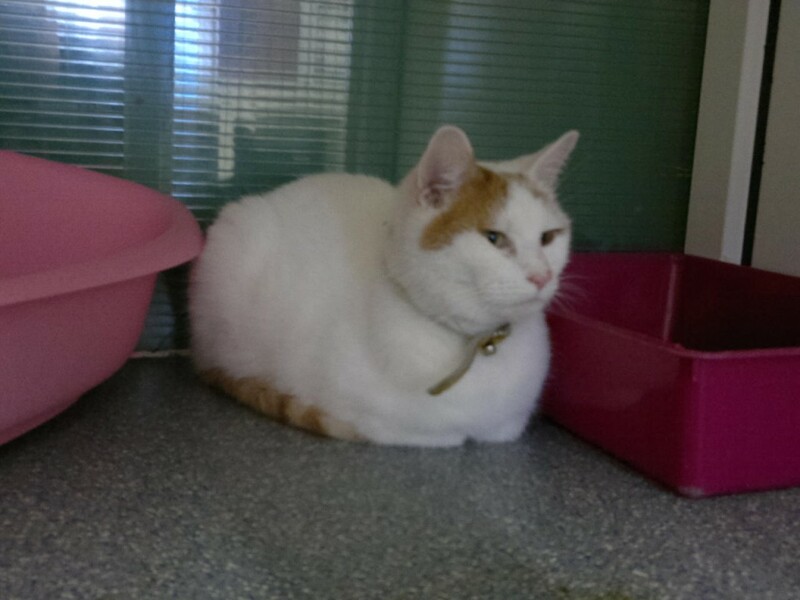 Oscar was rehomed in December 2011 after their previous cat was run over. He was the remaining fluff ball of a litter at the rescue. Soon after his arrival home he developed runny eyes but following vet treatment and after several weeks of love and care, Oscar well and truly came out of his shell. We hear he’s become a confident tearaway who just loves his cuddles. He particularly loves to sleep on the backs of his owners necks whilst they watch t.v.! Oscar has quickly made himself part of the family, so much so that their Daughter calls him her Brother! A wonderful successful adoption.